The Advance Steel databases are usually installed locally on the computer on which Advance runs. Companies with several Advance licenses can store them centrally on a server computer, so that all users work with the same databases. Please, also take into account the Notes at the end of this FAQ. Advance Steel must be installed on all local computers (it is not necessary to install Advance Steel on the server). The operating system on the server computer must be at least Windows 2000. This FAQ presents the necessary steps to make the local databases accessible on the network for several users. 1. Create a directory on the server computer (e.g. Data) and save it with full access permissions for all users. The directory must be created on a partition that uses NTFS. 2. Copy the first database (e.g. AstorDetails.mdb) in the directory and make sure that the database is not write protected. 3. Open the file properties of the database (e.g. 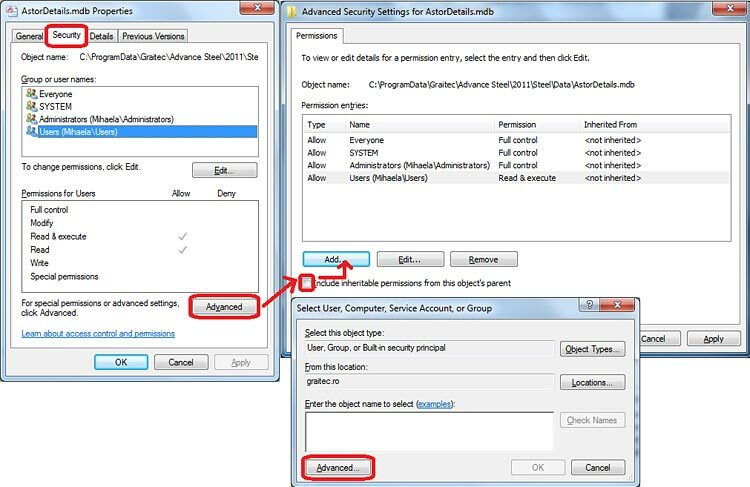 AstorDetails.mdb) to change the security settings. Go to the "Security" tab and, then, select "Advanced" (see the following figure). First, deactivate the "Inherit from parent the permission entries that apply to child objects. Include these with entries explicitly defined here" option. This option must be deactivated because the directory in which the file is stored specifies complete access permissions, which should not apply for the database. When this option is deactivated, the user "all" is automatically removed from the list that specifies the permissions to this file. - Next, click Add, to allow users (depending on your company / construction office) the access and the editing of the file. The following figure illustrates the process described above (the user "Mihaela" may read the database). 4. Open the DatabaseConfiguration.xml file from the Graitec\AdvanceSteel\[Version number]\Configuration directory on a user computer and change the path of the AstorDetail file to the directory on the server (see the following example). - Steps 2 to 4 must be performed for all Advance Steel databases, which are stored centrally on the server. 5. To store the Astorprofiles[Year] - database for network access it is necessary to change the corresponding entry in the registry. First, store a copy of the database in the directory listed above on the server. Then, click on the User-PC and then "Run". Next, enter "regedit". Go to the HKEY_LOCAL_Machine / Software / Graitec / DatabaseConnections directory and change the corresponding value. Check the changes made on operability on the customized computer. Then copy and, respectively, replace the DatabaseConfiguration.xml file on all other user computers. 1. It can be meaningful (and, also, recommended) to assign writing permissions for one or several users in the case of specific databases! This way, for example, the table defaults of the connection functions in the AstorRules.mdb database are stored. By using the writing permission for this file, a user has the option to create other connection templates and to give them to other users. User permissions should be decided by your company. 2. It should be mentioned that through the relocation of the databases on the server and the often access of several users to the database, a certain delay of the work with Advance Steel can occur. These delays are dependent of your system and cannot be attributed to Advance Steel.